The 2015 Media Trends Affecting Online Newsrooms highlighted 9 areas where companies, both large and small, are missing opportunities. Here is the checklist. Use it to evaluate your newsroom. A featured story with visuals: Most company newsroom are still web 1.0. There’s just a list of press release headlines with a link to the full release. The public and the media want visual content. Feature your main story and include a visual that captures the attention and enhances the story. Make the newsroom a digital content hub. Connect to the brand’s social media channels. Include all brand content. Make it the one-stop venue where the public and the media can find information and news about the brand. PR contacts. A journalist should never have to search for your PR contacts. Put the contacts on the main page of the newsroom as well as on every press release. It does no good to have press releases show up in search when a journalist is researching a story if there is no contact listed on that release. Expert database. Every company has experts. After all, it’s your business. There will be people in your business who know more about it than anyone else. Figure out who those people are and what their area of expertise is. Put them in your newsroom, along with a short video interview about their area of expertise. Image gallery. The demand for visual content has exploded in the last year and shows no signs of abating. You might not be a world-class photographer, but you have a good camera right in your smart phone. Make the effort to learn to use it to take great original photographs and snap away. Post all relevant images to your newsroom (optimizes for search of course) Resource: How to take brilliant photographs with your smart phone. Video gallery: Because there is such a demand for videos from the public, the media is looking for great videos with news stories. Many media newsrooms lack the resources to create these videos. This is one of the major opportunities for a brand to get media coverage. Invest in talent, equipment and training so that your PR team can make short, interesting news videos and host them in your newsroom. (Note: You can even do this with your smartphone or tablet) Offer an embed code with every video, so that journalists and bloggers can use your videos with just a few clicks. Your newsroom platform should allow you to add videos from your video gallery right into a news release with just one click. Curate industry news & trends. This is another PR opportunity. Most journalists are looking for trend stories, not just news about your brand. 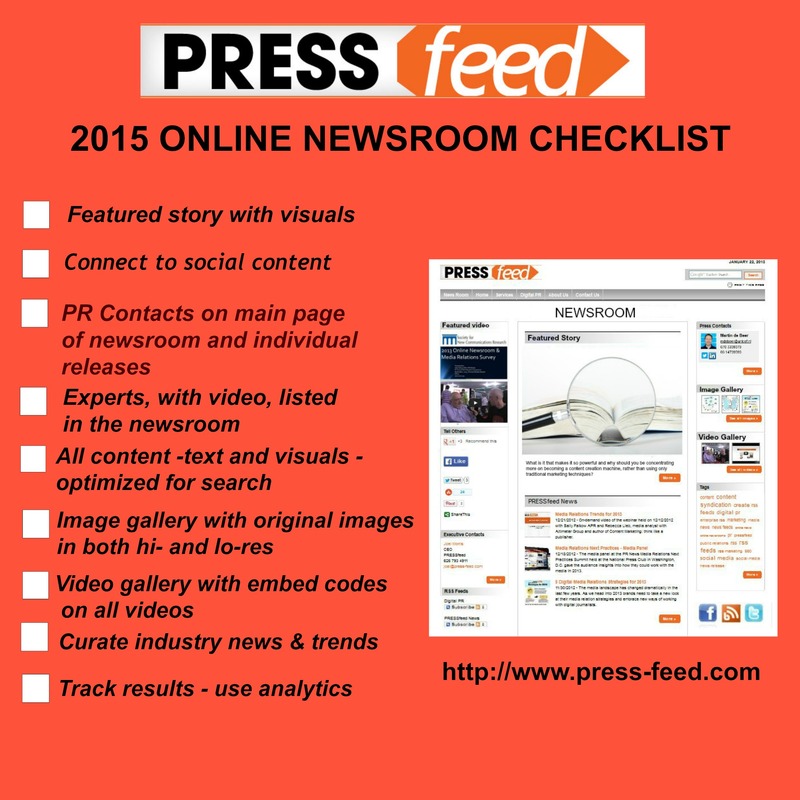 Your newsroom could become a resource for the media. If you do not have these features in your current newsroom upgrading to a digital content hub should be on your to-do list for 2015. It will make a world of difference to your earned media coverage.